Origami is the traditional Japanese art or technique of folding paper into a variety of decorative or representational forms, as of animals or flowers. Aragami on the other hand is slightly more lethal and equally more stealthy. It was originally going to be called: Twin Souls, but has since been changed to the current title: Aragami. The game bases itself around Japanese Mythology, so you’ll find quite a few nods to it scattered around the maps. 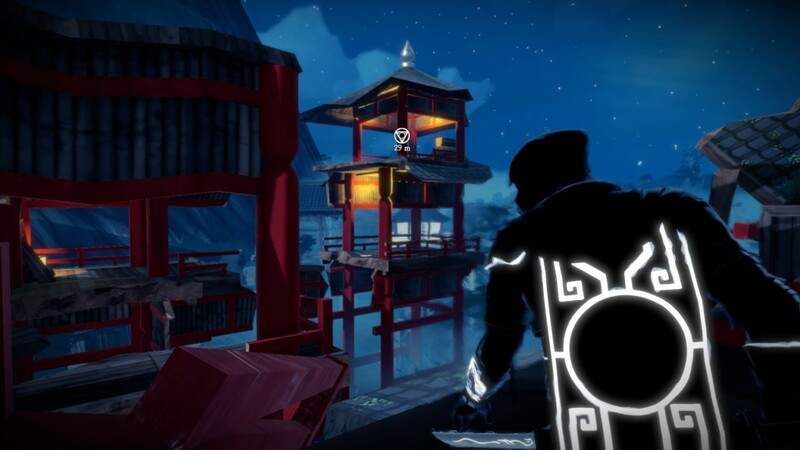 You are the titular: Aragami, a being made solely out of shadows. You’ve been summoned for one purpose only, to release the girl Yamiko who has been locked away. So in that case it’s a bit like Mario, but with less Bowser and more stealth and/or more viscerally killing enemies. As a being made of immaterial substance, you also have access to supernatural powers. These will help you in your quest to rescue her from Kyuryu, the city fortress. There’s a lot of exposition being done by the Yamiko as she’s capable of casting a wisp of herself at your side and she’ll show up every now and then to show you certain landmarks or give you some explanation around certain events in the game. This way there’s a lot of ‘telling not showing’. In most media, it’s helpful for it to be the other way around because that makes the audience more absorbed into the material, but in this case the ‘telling over showing’ method works quite well. Aragami looks beautiful. The visual style works perfectly and is quite crisp and clear. The game takes place during the night, as that’s when a shadow creature such as yourself would be most suited, but having said that, it doesn’t mean you’ll only get to see monochrome blue or dark vista’s. The developers haven’t taken the easy way out and just turned up the blue filter in the Unity engine and called it a day. There are temples and courtyards that look like tiny villages in and of themselves and if you aren’t careful, you might lose focus and be detected as you look around and wonder. You’ll notice when enemies have seen a glimpse of you by the question mark over their heads, or by the bar that’ll turn from yellow to red as they ascertain your location. Aragami looks like it plays smooth and slick. The blur when you turn the camera around is a little annoying but a small annoyance at that. The game is really well done music wise. It heavily revolves around stealth, so the music is low key tune with oriental hints in it. The calmness of the music strangely keeps you on edge. When combat can’t be avoided, the music changes. It turns into more upbeat and makes it clear you’ll have to make sure the enemy stays down. Aragami has a form of voice acting and though it’s obvious not every word is being voiced, the intention behind the conversation is quite clear. Emotions can be heard from the few words -for lack of better term- the characters say. The enemies don’t have different voices and they all sound the same which only becomes clear as you listen to them closely. Then again, with the guards being nothing but burly men, it’s difficult to voice then differently then the developers have done, so for all intents and purposes, it’s a job well done. 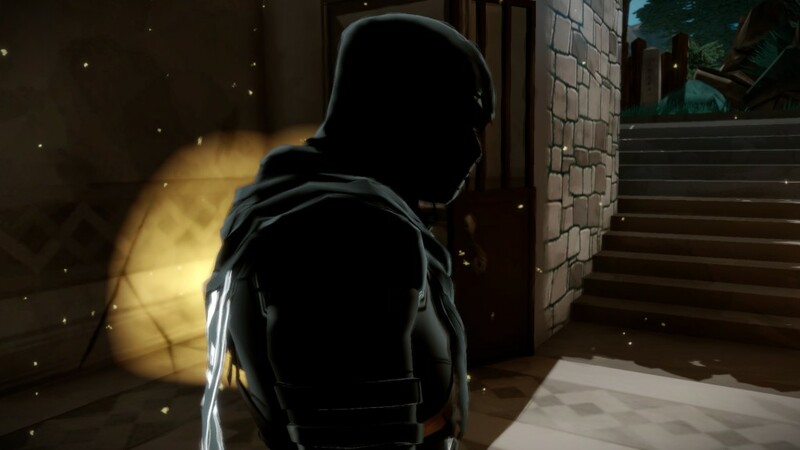 Aragami is a third persion, stealth action/adventure game. 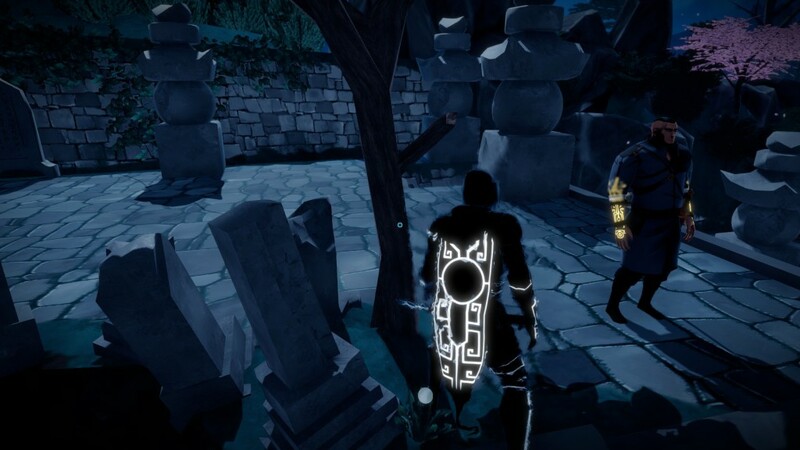 You’ll be playing as Aragami and you’ll have to navigate maps, all the while avoiding or killing the enemies barring you access. When you play the game on a keyboard, you’ll have to change the keys up a bit, as controlling your character won’t be a problem, seeing as the game holds itself to the ‘W,A,S,D’ code, but it’s when the extra movement controls come in that it becomes a strain unless you change them. Default the ‘crouch’ key is the left control button. Having to both press W and left control to succesfully get past guards is gruesome on your fingers and will most likely get you cramps before you’ve cleared the first area. You also can’t jump. If you are wondering what kind of asinine assassin Aragami is, well you’ll be surprised to know you don’t to jump as you’ll be able to teleport to higher ground. Right mouse button will make that possible, but know that you’ll only be able to do so from shadow to shadow, so that power isn’t limitless. As you progress you’ll unlock more items and powers to make navigating the maps easier. Easier, not completely easy. You might be able to spout a dragon from the shadows to take down the enemy, take him out from afar with a kunai, or lure him to you with the ring of a bell but it doesn’t mean the enemies will go around falling into your trap. The A.I. is Aragami’s biggest annoyance, both the titular hero as the game itself suffer from the A.I. not even holding itself to the ‘rules’. Case in point being when you crouching in the shadows. It must be said that it doesn’t need to completely hide you, as this might break the suspension of disbelief of players. When the enemy walks past you several times and doesn’t notice you when you are just standing around -in the shadows, mind you- only to notice you when you crouch when you are supposed to be even less visible makes no sense. This strangely happened quite a few times. It might be patched out later, but as it stands now, it makes the A.I. feel wonky. It’s ok when a game is difficult, however it’s something completely different when a game feels unfair. 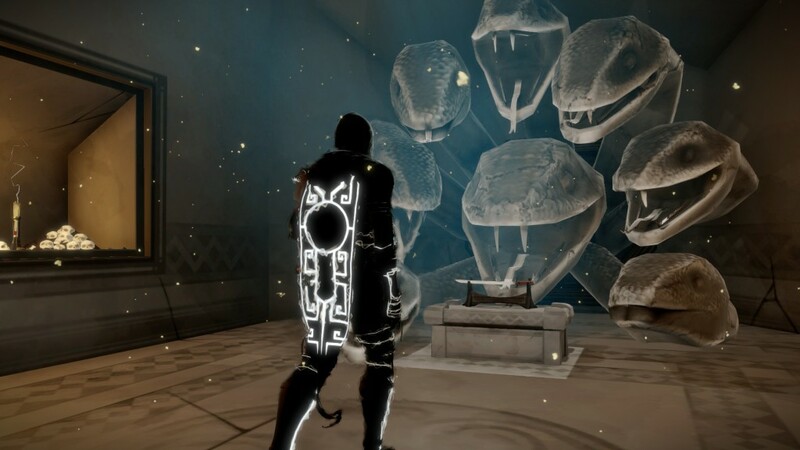 Aragami is a game high on stealth with quite some replay value, completing missions without killing anyone, or killing everyone or not being seen are all options that make replaying fun and make it more challenging. If you are looking for a game with the stealth mechanics in the vein of Metal Gear, then Aragami is all for you. However if you are looking for a game that is more action based and fighting your way out of a sticky situation when you’ve cocked up the stealth gameplay, then you’re better off looking elsewhere.